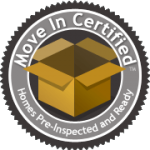 MoveInCertified homes have been pre-inspected and the sellers confirm that there are no major systems in need of immediate repair or replacement and no known safety hazards. The inspection reports are hosted on www.FetchReport.com. Interested parties can ask the listing agent or seller for access to view.